LONDON, Feb. 15, 2017 /PRNewswire/ -- Hertz Global Holdings, Inc. (NYSE:HTZ) has announced its sponsorship of the DRIVE Innovation Center (www.drivetlv.com) launched by the Mayer Group in Tel Aviv to promote the development of cutting edge technology for the smart mobility domain, including car rental. The DRIVE Innovation Center is the first of its kind and will introduce Hertz to Israeli-based start-ups and entrepreneurs to provide them with guidance on car rental business model development and value creation, as well as explore partnership opportunities. Hertz will have first-hand insight into potentially disruptive technologies with the chance to influence the development of the next generation of innovative ideas. Tyler Best, Hertz chief information officer, said: "We are very excited to join the DRIVE community of smart mobility innovators in the 'Silicon Wadi.' Being involved in initiatives like the DRIVE Innovation Center program enables us to stay connected to development efforts around the world. It also complements our own research and development activity, which is aimed at helping us remain competitive and truly differentiated in this rapidly emerging sector. "Additionally, we are pleased with the opportunity to work with fellow DRIVE sponsors Volvo Cars, Honda Silicon Valley Lab, and Israeli telematics company Ituran," added Best. Michel Taride, group president of Hertz International, added: "Through the DRIVE concept, we will be collaborating with start-ups and entrepreneurs in Israel on defining real-world applications for their ideas for smart mobility including car rental, and providing them with the opportunity to pilot their initiatives. Our ambition is to seek out and influence the development of disruptive innovation to transform aspects of our core business model as well as drive customer experience to a whole new level." The Hertz sponsorship of DRIVE also builds upon the company's long-standing partnership with Mayer Cars and Trucks LTD, which has operated Hertz car rental and leasing in Israel for more than 40 years. The DRIVE center incorporates a start-up accelerator, advanced prototyping labs and co-working space. The building itself has been designed with meeting rooms and shared open work spaces that encourage networking and collaboration. The center is located at Shevach, 7 Tel Aviv. DRIVE will be led by founding partners Omer Shachar, Dr. Tal Cohen and Boaz Mamo. Mr Shachar is an investment executive from the Mayer Group. Dr. Tal Cohen serves as adjunct associate professor at the Georgia Institute of Technology in Atlanta, and is an entrepreneur who has founded and invested in companies now worth hundreds of millions of dollars. Mr. Mamo is a specialist in smart mobility entrepreneurship and founder of EcoMotion and Capsule, a smart mobility accelerator. The Hertz Corporation operates the Hertz, Dollar, Thrifty and Firefly vehicle rental brands in approximately 10,000 corporate and franchisee locations throughout North America, Europe, Latin America, Africa, the Middle East, Asia, Australia, and New Zealand. The Hertz Corporation is one of the largest worldwide airport general use vehicle rental companies, and the Hertz brand is one of the most recognized in the world. Product and service initiatives such as Hertz Gold Plus Rewards, Carfirmations, Mobile Wi-Fi and unique vehicles offered through the Adrenaline, Dream, Green and Prestige Collections set Hertz apart from the competition. Additionally, The Hertz Corporation owns the vehicle leasing and fleet management leader Donlen Corporation, operates the Hertz 24/7 car sharing rental business in international markets and sells vehicles through Hertz Car Sales. The Hertz Corporation is a wholly-owned subsidiary of Hertz Global Holdings, Inc. For more information about The Hertz Corporation, visit: www.hertz.com. 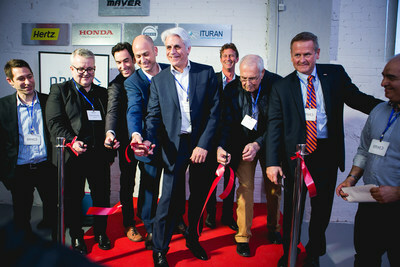 For more than four decades, the Mayer Group has leveraged a far-reaching vision and solid, value-oriented management to become one of the trailblazers in the Israeli automobile market. Mayer's activities include import, sales and service for top private and commercial automotive brands, car-rental and leasing, public transportation, bus manufacturing, tires import and others.